The state of the U.S. economy recently has become an increasingly partisan topic, but there are basic facts on which everyone can agree. The continued positive job growth and latest gross domestic product (GDP) growth numbers have brought about some excitement in the last few months. While these measures of progress are important, they reveal less about the health of the day-to-day economy that most workers experience. Real wages have been flat for most of the last decade—particularly since President Donald Trump took office. 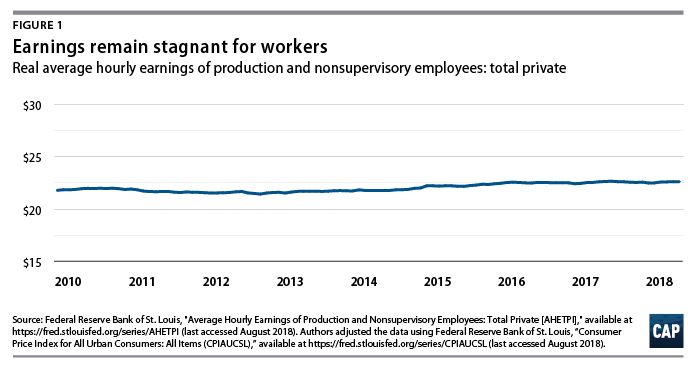 To understand the health of the economy as workers see it, policymakers should look more closely at earnings—an indicator that shows the true progress, or lack thereof, facing many workers. Figure 1 shows that a wage-centered perspective is especially important, because real wage growth is how middle-class workers typically benefit from economic growth. Soaring corporate profits, on the other hand, provide little to no gains to virtually all workers. With the slow growth in earnings; the rise in credit card, mortgage, and higher education debts; and the costs of child care, health care, and other salient needs continue to grow, it’s understandable that many workers feel their economic position is precarious. As seen in Figure 1, wages are indeed flat. In fact, they have risen just 0.89 percent since January 2017—less than 1 percent real wage growth. For starters, this means that workers are not seeing the gains that they should. Despite the fact that the country is experiencing positive GDP growth, the benefits are not trickling down the way Trump predicted they would. In other words, the system in which the economy functions has not fairly nor equitably distributed wage gains to workers. This is hardly a new trend, but it is one that deserves more attention as the results of policies that move further in this direction emerge. Previous CAP analysis explains that the benefits of GDP growth are not shared equally and instead have increasingly gone to those in the top income bracket, including through the recent tax cuts that largely went to corporations and the wealthy. Positive quarterly GDP growth is important—workers’ incomes can’t outpace GDP growth indefinitely—but using this as the only measure of overall prosperity is increasingly insufficient. It’s not just wage stagnation that illustrates this issue of lackluster growth for workers. Today, more people are choosing not to work. The ratio of working-age adults is still well below the 81 percent rate of the 2000s. Traditionally, low unemployment also gestures toward wage increases, since workers are in greater demand. In simpler terms, as the pool of workers actively seeking jobs becomes smaller, workers have relatively more bargaining power and can negotiate for higher wages or turn down a less than adequate job for another one. Yet, today, with the unemployment rate near historic lows for some time, workers are not experiencing the wage growth they expect, suggesting that structural factors have made wage growth enduringly elusive. Low unemployment numbers also don’t necessarily indicate that workers have the necessary safeguards were they ever faced with a financial emergency, such as an accident, unexpected job loss, or home repairs. In fact, most people don’t even have enough savings to cover an unexpected $1,000 emergency. 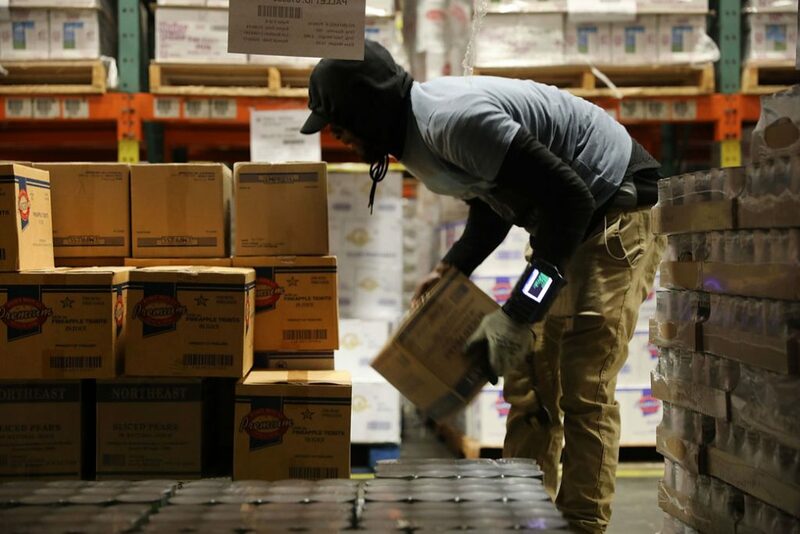 Despite low unemployment and high GDP numbers, the reality behind wages, growth, and underemployment suggests that workers may not be seeing the gains and opportunities of an apparently booming economy. Instead, real wage levels indicate that these figures may be overstating the economic prosperity of the last few years and instead signaling that workers may be settling for jobs with lower wages than desired simply to get by. Fruitful assertions about the state of the economy should be taken with a grain of salt until it becomes clear that these gains have truly been shared. Considerations like this spotlight the need to heavily consider a backdrop of factors affecting American workers when assessing the health of the economy for all as well as the need to be cautious of the deficient claims that will surely make their way around the Twittersphere as the newest data is released. Daniella Zessoules is a special assistant for Economic Policy at the Center for American Progress. Michael Madowitz is an economist at the Center.